Contains no monkey business! Part of your 5-a-day. Under 150 calories. High Fibre. Gluten Free. No added sugar. 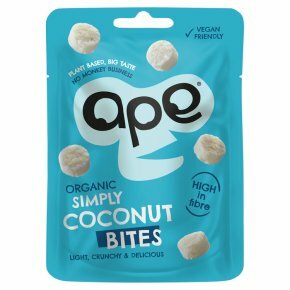 Suitable for vegans.Ape is all about delicious & healthy! Snacks should be super scrumptious & monkey-business-free! Seriously! Our Coconut Bites are baked, not fried, & mixed with a sprinkle of Sea Salt. Munch happy! What's so great about coconut bites?